A family-friendly collection of simple paleo recipes that emphasize protein and produce, from breakfasts to entrees to treats, from the popular gluten-free blogger of Elana's Pantry. 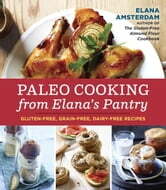 Author and beloved food blogger Elana Amsterdam has been living grain free for over ten years; in Paleo Cooking from Elana’s Pantry, Amsterdam offers up her streamlined techniques and recipes with minimal ingredients for busy cooks on the run. She transforms simple, classic family favorites such as pancakes and ice cream with Paleo-friendly ingredients like almond flour and coconut milk. * Paleo Cooking from Elana’s Pantry* includes nearly 100 recipes featuring the Paleo mainstays of lean proteins and simple vegetable dishes, plus wholesome sweet treats—all free from grains, gluten, and dairy, and made with natural sweeteners.